Just released physically, Grimes’ Art Angels is a brightly colored collection of artpop magical realism. The drumline beats and sunny guitars and melodies of “California” and the title track could almost pass for something on mainstream radio, if not for Clare Boucher’s clarion voice cutting through. Similarly, the nimble “Flesh Without Blood” might not be the most original song Grimes has put to tape, but it’s the catchiest and is damn near irresistible. Yet in between those songs we get “Scream,” which has none of the safety of her more accessible tunes, between Taiwanese rapper Aristophanes’ twisting flow and Boucher’s curdled screech. The previously released “REALiTi” throws fans of her more straightforward electro-pop a bone, though it continues with the posi vibes and influences of K-pop and early ’90s house that flow through the rest of the album. Meanwhile, “Venus Fly,” her spacey hip hop duet with Janelle Monae, is a pure delight, coming off like a futuristic art-school spin on the Spice Girls, and “Kill vs. Maim” has the feel of the drama kids taking over a pep rally with Boucher’s yelp simultaneously spirited and demented. Boucher has no use for genre boundaries and is seemingly allergic to negativity, all of which gives Art Angels an unbeatable all-embracing energy. The biggest change from Visions is that Boucher’s personality is more front-and-center; whereas that album could be more cold and cerebral in its in-between tracks, Art Angels is entirely engaging, and even its most digitized moments are stained with blood. We loved together PANGEA’s last album, Badillac, but this is just next-level. Produced by The Replacements’ Tommy Stinson, there’s more than a little bit of that band’s piss ‘n’ vinegar as filtered through TP’s surfy garage pop melodies (that sounded a lot grosser than I meant it to). The jangly track comes rom The Phage EP, which is out tomorrow on Burger. Winter’s Supreme Blue Dream has been one of the sweetest albums to come out of L.A. this year, a candy-colored swirl of shoegaze guitars and feathery melodies. “All the Things You Do” continues in that same vein, its loungey chords and kaleidoscope synths giving way to bruising guitar swells. 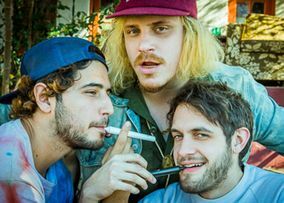 It’s the first new song they’ve released since Supreme Blue Dream and could be on a new album the band is looking to release next year. They’ll be at S.F.’s Brick and Mortar Oct. 18 and L.A.’s Echo Nov. 24. Download the song now from Amoeba.com! The new album by L.A. garage greats together PANGEA is called Badillac, which is amazing. And so is the song, a more laid-back song for the band showing off their melodic side. Get excited for Badillac, which is due next week, Jan. 21, on Harvest (they’ll be at The Smell that day, too). Hear it at Soundcloud. Ben Chasny is a busy guy, having released scores of music as psych-folk act Six Organs of Admittance, with acid-rockers Comets on Fire and others. Now he’s teamed up with Donovan Quinn of Skygreen Leopards as New Bums. The first taste, “Black Bough,” is a beautiful little ditty with some orchestral brushes and amazing acoustic guitarwork. Voices in a Rented Room is due Feb. 18 on Drag City. 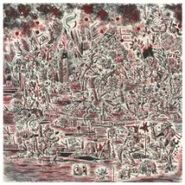 Cass McCombs’ wonderful new record, Big Wheel and Others, is a big record, in length (22 tracks), scope and humanity. Ostensibly a folk-rock record, it dabbles in country, blues, rock ‘n’ roll and just about every other genre that can be lumped into the general, overarching term “Americana.” Yet this isn’t a reverent record by any means. Much as his prior records did, such as 2011’s double whammy of Wit’s End and Humor Risk, songs veer into avant-garde atmospherics; lyrics defy their genre’s constraints, such as the country-rockin’ “Big Wheel,” which delves into the manhood country music often stands upon (“the taste of diesel and the sound of big rigs,” he sings, before later undercutting such manly imagery with lyrics like “a man with a man, how more manly can you get? I may be 5-foot-one, but you’re all wet”). Interspersing the tracks are interludes cut from the 1970 documentary short Sean, about a hippie kid who smokes weed, plus two versions of the same song, “Brighter!,” one sung with the late actress Karen Black, with whom McCombs also dueted on the Catacombs highlight “Dreams-Come-True-Girl.” I sat down to ask McCombs about the epic new album.